From the producers of Salt and Transformers, follow the intense journey as one mother shows how far she will go to save her child in the non-stop thrill ride "Kidnap," coming to Digital on Oct. 17 and on Blu-ray™, DVD and On Demand Oct. 31 from Universal Pictures Home Entertainment. 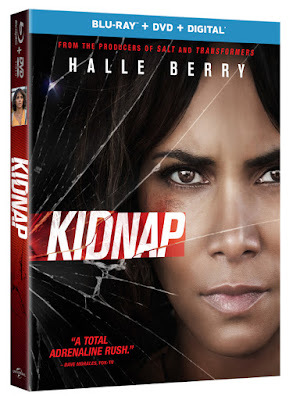 Produced by and starring Academy Award® winning actress Halle Berry, "Kidnap" is the story of a mother who must confront a parent's biggest fear and the relentless pursuit that ensues as she grows increasingly empowered to rescue her child. Bring home the "intense, suspenseful and thrilling" (Dave Morales, Fox-TV) adventure on Blu-ray™, DVD and Digital and discover a special behind-the-scenes featurette that takes viewers inside the film's powerful story. A typical afternoon in the park turns into a nightmare for single mom Karla Dyson (Academy Award® winner Halle Berry) when her son suddenly disappears. Without a cell phone and knowing she has no time to wait for police help, Karla jumps in her own car and sets off in pursuit of the kidnappers. A relentless, edge-of-your seat chase ensues, where Karla must risk everything to not lose sight of her own son. In this tense, action-fueled thriller, from the producers of Salt and Transformers, one mother's heroic attempt to take back her son leads her to ask herself how far she will go to save her child. A Look Inside Kidnap – Star Halle Berry, Director Luis Prieto, and 2nd Unit Director/Stunt Coordinator Steven Ritzi discuss how Karla Dyson's desperation to rescue her son made her capable of the extraordinary.